Below see past exclusive Spain insider fun….. 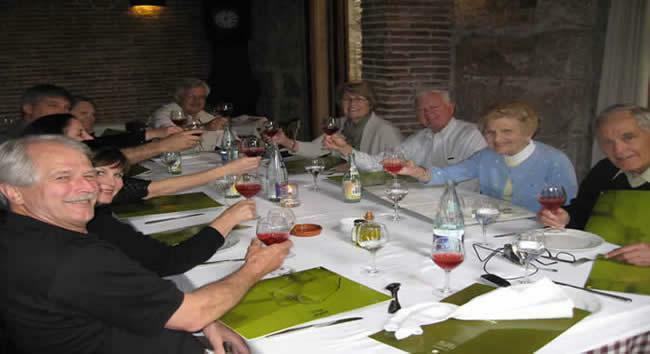 Famous Fun… Actor Martin Sheen & amigos in Madrid with fine wines & tapas. 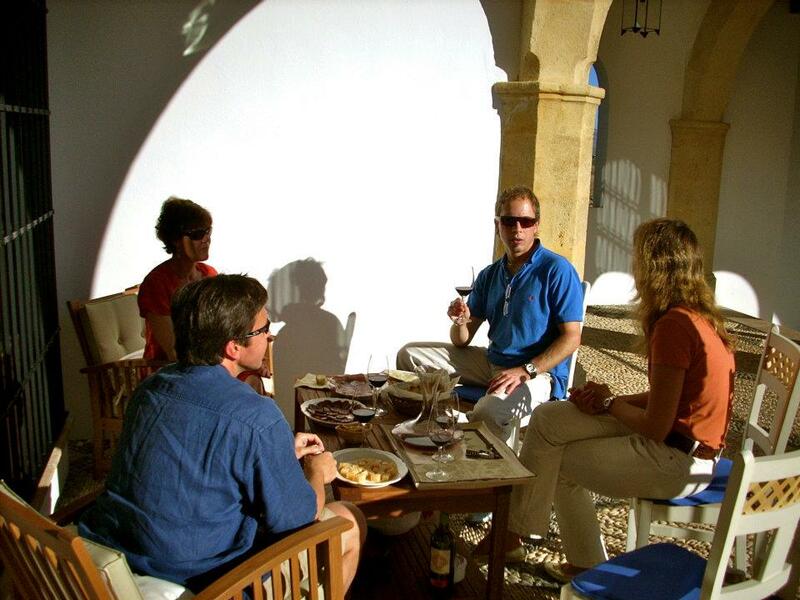 Insider Fun… as Spain residents, we set the stage so you enjoy more in less time..
Wine Fun…..tasting with the winemaker, just taste better for some reason! 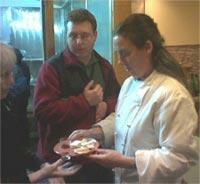 Foodie Fun….. Spanish cooking class and meal for our Virginia group of friends & family . Historic Fun…. 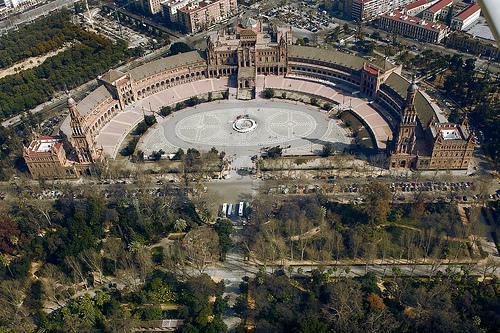 Discover Spain by helicopter, on foot or luxe mini coach. Spain Water Sports Fun…. 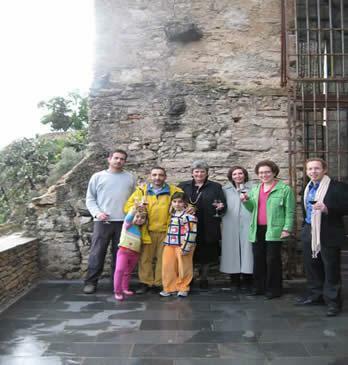 David Rose and family enjoyed soft adventure, Spanish conversation classes and great food & wine in 2008.
in a Spanish medieval village. national team or La Liga with top clubs like Real Madrid, Barcelona or others. Experience Sevilla!…Our Spanish friend Merce demonstrates the local festival dance. 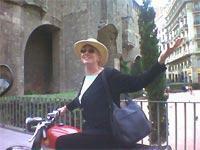 of Mallorca and Menorca, Valencia in 2006. Tours are very limited based on staff availabilty, don’t put it off and regret it later. YOU CAN RESERVE NOW to guarantee your 2012 space! 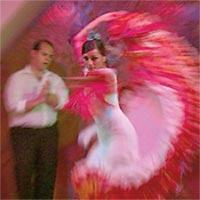 Experience Flamenco!… Spanish guitar, song and dance has unforgettable power and passion. We set the stage,YOU enjoy more insider fun . 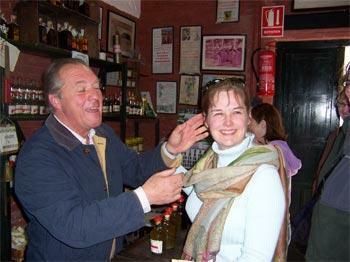 John & Marta learn a new game awaiting friends for a 7 day guided Spain wine tour. Custom Spain Fun….Walk, Bike, Dance, Yoga, Wind or Kite Surf or Sports Massage, Medieval villages, wineries, fine food, castle hotels, luxury, flamenco, art, gardens, islands, music, yoga or walks await. Just round up friends or family for a well-deserved vacation…..We’ll set the stage! Experience Barcelona!… Teacher Mary Jane Gaudet and husband visited Spain 3 times including Barcelona, Seville, San Sebastian, Granada, Lisbon and Madrid. 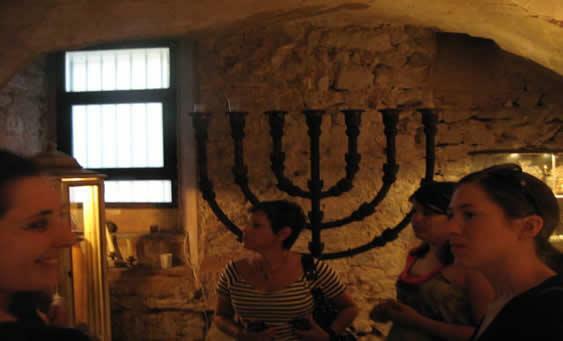 Jewish Spain Fun….. Sephardic heritage Spain tours with a chauffered Mercedes in Girona, Toledo, Cordoba & more. 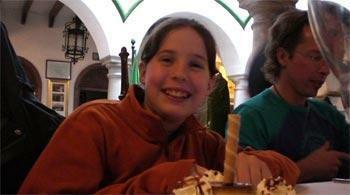 Dessert Fun!…..like Matty from Chicago after exploring a hilltop medieval village & castle in Spain with her family helped our guide Dan O’Beirne! Olive Oil Fun!…. like University of South Dakota’s Diane Vandenoeve and 30 students on a educational student trip in Andalucia, Toledo and Madrid. Tours are limited based on staff availabilty, don’t put it off and regret it later. YOU CAN RESERVE NOW to guarantee your space! 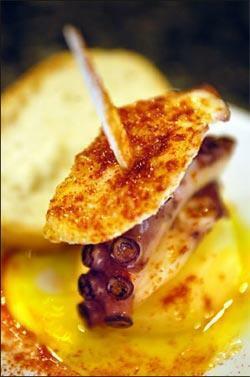 Tapas Foodie Fun…… a great reason to visit Spain! Vino Fun…. 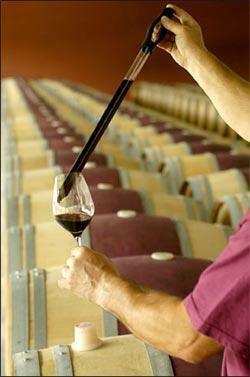 tasting wine straight from the oak barrels with the winemaker! 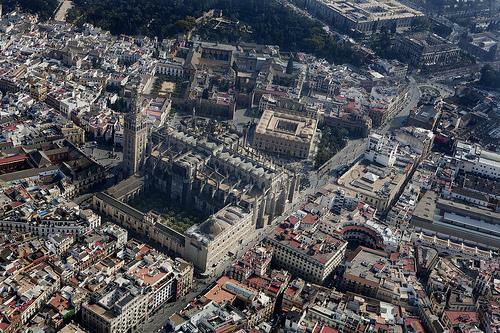 Exclusive Fun…… southern Spain’s Andalucia from our helicopte as Tom Cruise did while on location for his 2010 action movie in Seville. 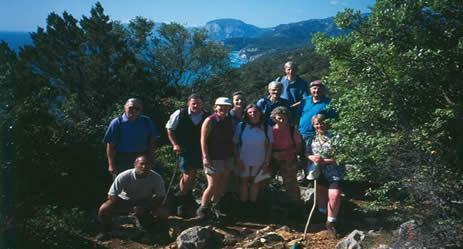 Experience diverse regions, cuisine, villages of Spain + 4 official languages( but little English spoken). tailor-made trips, made to fit for your family, friends or colleagues. To Get Your Vacation Started – Contact Us! Dreaming of buying Spain real estate property? …. try our bilingual consulting services. Por los responsables de turismo, sabemos que el mundo de turismo es muy competivo. Por eso ofrecemos ayuda para mejorar y promcionar su oferta de productos y servicos de turismo de calidad. Intendemos bien como añadir valor adaptando a las expectivas de los viajeros para que llegan a sentir fans. Contactnos por una consulta de promocion de turismo de calidad. Spain and tiny Portugal together would be largest country of western Europe. Spain alone is about the size of Texas and offers many undiscovered attractions that most won’t find alone even with a stack of clunky guide books and maps! 1. EXOTIC DIVERSITY & JOIE DE VIVRE: Spirited Spain offers many themes… food & wine, medieval castles & villages, hip cities, ancient tradition, superb art, olive oils, luxury hotels, warm Med beaches, huge forested mountains, + a mix of east and west with still discernable Medieval, Arabian, Sephardic, French & Roman influences…if you have the insider’s savvy! 3. SEVILLA: Quintessential Spanish traditions of flamenco , tapas, toros & horses are king here + Moorish towers, the world’s largest Gothic cathedral, lush gardens, and a joy-to-be-alive attitude in this deep south river city of Spain. 4. 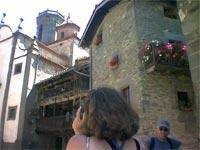 CATALONIA: Barcelona, Pyrenees mountains & villages, architecture, Med coast & taste. 5. 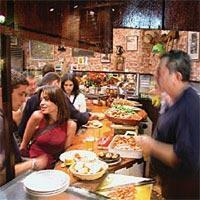 TAPAS CUISINE, WINES & 100+ CHEESES: Learn the Ritual of “El Tapeo” or Eating Tapas with locals. 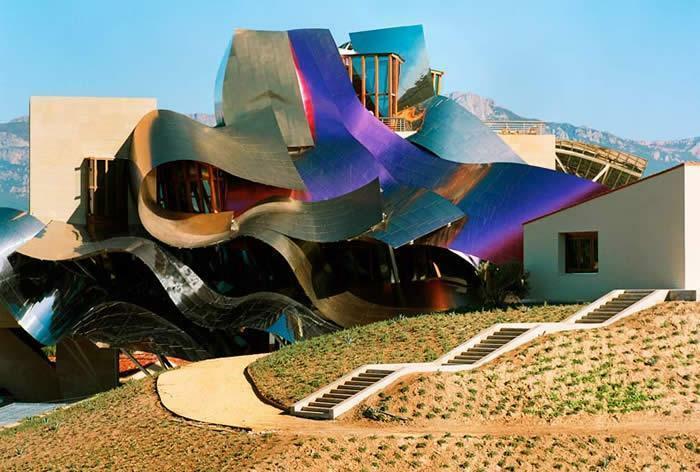 Wine lovers….can discover why Robert Parker calls Spain the “ a new 21st century power of the Wine world”. we can offer 100+ cheeses. 9. PASSION OF FLAMENCO: Live Flamenco Guitar, Song & Dance. 10. 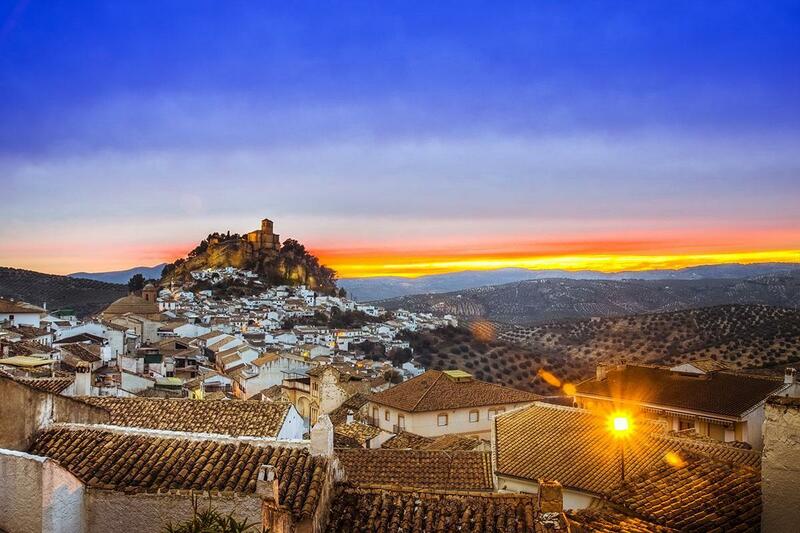 EXTREMADURA: Ancestral Tradition, Roman Heritage, Gourmet Ham, Cheeses & Hospitality ! 11. 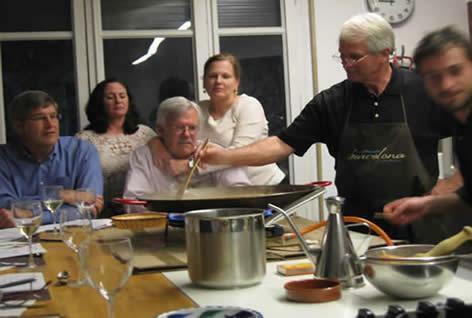 LEARN ON VACATION: Cooking, Language, Dance, Guitar, Yoga or Wine 101. 14. FINE OLIVE OIL: Spain is the world’s #1 producer… Yes the italians buy here to resell. 18. 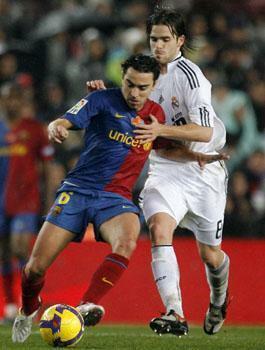 SPORTS: Golf, Hike, Bike, Scuba Wind or Kite Surfing or the, stadiums of 80,000+ roar at football matches of the La Liga . Top teams include: Real Madrid, La Barca, Sevilla. 20. HISPANIA: Discover Roman Spain, Theaters, Arenas & Bridges from Hispania where 2 Roman emperors Trajan and Hadrian + Seneca , Martial and others were born. 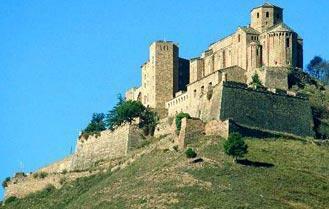 Spain is Europe’s most diverse & friendly place as medieval & modern mix with Mediterranean spirit. We set the stage… You Experience More in Less Time. Since 1998 thousands have discovered Iberia with us. Peruse customer comments, FREE Spain Travel Guide and contact us to get your inspiring Spain cultural adventure started. Note the list above is a limited sample. After 14 years organizing thousands of vacations & events here, we have long list of known + “top secret” discoveries and contacts. As years of professional expertise is valuable, we are reserving some items & detail for clients only. This sample list is based on historic and cultural importance plus esthetic, cultural, historic & emotive power. Of course, we have many more next door in charming Portugal! Win a FREE wine tasting in Spain. Why does Italy buy 50% of Spain’s olive oil? Did Christopher Columbus have a secret Seville connection? What fascinated Hemingway so much in Spain? Origins of the siesta, bullfights and flamenco? Was Picasso inspired by a Nazi blitzkrieg? Why does Spain have 4 languages? Why did the Romans need 175 years to conquer Hispania? Why does Catholic Spain have the world’s lowest birth rate? What are the top Spanish wines and where can I buy them? Where is the Conquistadors’ New World gold now? Savor Spanish tapas Cuisine & Wine tours, check out Medieval villages, feel the energy of flamenco dance, magnificent ancient palacios with Roman mosaics or Moorish fusion architecture….in historic Spain and Portugal with Spain Small Group Escorted Trips and Custom Private Spain Travel. To avoid disappointment, book your exclusive Spain experience ASAP. You will not regret it!